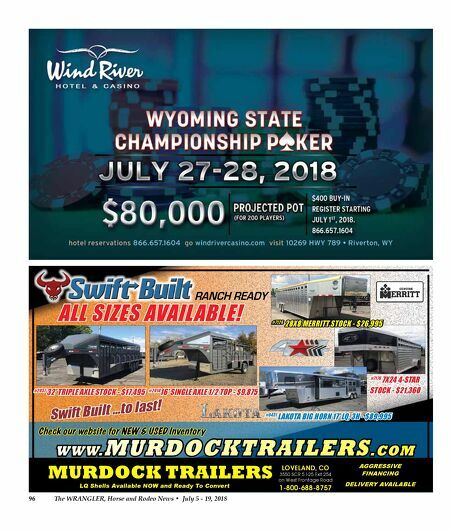 96 The Wrangler, Horse and Rodeo News • July 5 - 19, 2018 #7176 7x24 4-Star Stock - $21,360 w w w. m u r d o c k t r a i l e r s . c o m Check our website for NEW & USED Inventory murdock trailers LQ Shells Available NOW and Ready To Convert LoveLand, Co 3550 SCR 5 I-25 Exit 254 on West Frontage Road 1-800-688-8757 AGGRESSIVE FINANCING DELIVERY AVAILABLE Ranch Ready all SizeS avail able! #2057 32' triple axle Stock - $17,495 #7126 28x8 Merritt Stock - $26,995 #0451 lakota big Horn 17' lQ, 3H - $89,995 #2014 16' Single axle 1/2 top - $9,875 Swift built ...to last!